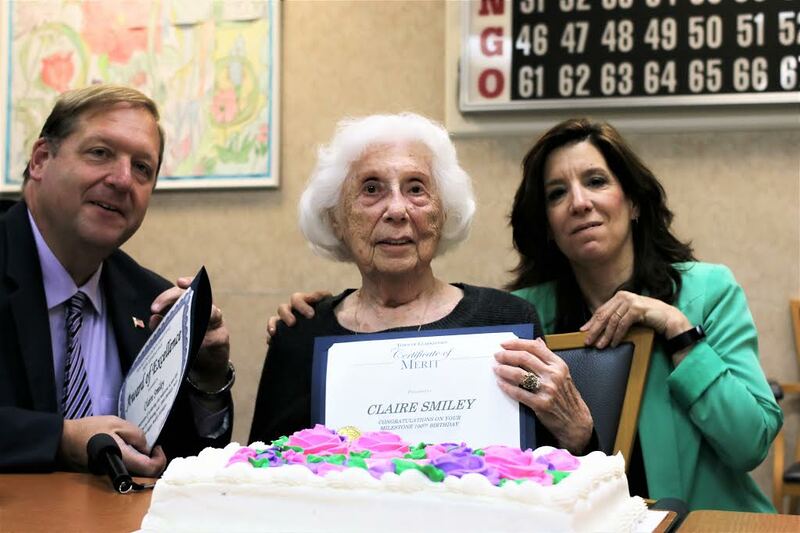 On Thursday, July 6 staff and clients from the Association of the Visually Impaired, Inc. (AVI) celebrate Claire Smiley’s 100th birthday, during the regular meeting of its Peer Support Group. Mrs. Smiley, who turned 100 on June 25, is a regular attendee at of AVI’s Social Educational Support Group, which meets the first and third Thursday of each month at 11 a.m. at the Promenade at Chestnut Ridge (Old Schoolhouse Road in Spring Valley). Claire is a widow who is legally blind due to macular degeneration and glaucoma. She was originally from Montreal, where she worked as a bookkeeper and raised two children. For the past two years she has resided in New City, with her daughter Judy Heilpern. According to Claire, when her vision worsened, Claire left her home in Canada to move closer to her daughters; both had married and moved to New York years before. It seems that blowing out candles is becoming old hat for the newest member of the centennial club. In late June, her daughter hosted a luncheon in her honor; among those in attendance were her nieces and nephews, who traveled from Montreal. “The following day we went out to a restaurant,” Mrs. Smiley added. According to Executive Director Beth Bate-DuBoff, it is customary to acknowledge the birthdays of the Support Group members at the conclusion of the meeting. “Members look forward to their special cupcake,” she said. “Additionally, each October, the agency hosts a 90ies Plus luncheon, which is one of the most highly anticipated events of the year. But 100 years of life is an incredible milestone. Her AVI family is honored to be able to celebrate it with her! The Social Educational Support group is free and open to the public; the objective of the group is to help adults of all ages to develop coping strategies to adapt to vision loss by providing peer support as well as access for community services which can improve their quality of life. Clarkstown Supervisor George Hoehmann showed up to wish Mrs. Smiley a happy 100th. For more information on the Association for the Visually Impaired please call 845-574-4950.